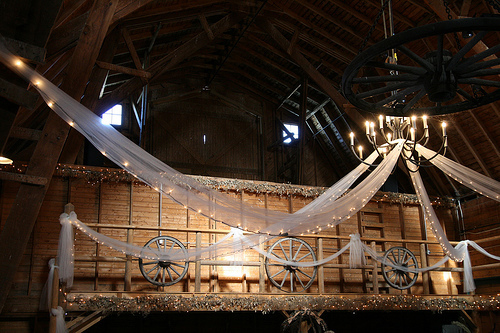 How do you decorate a barn wedding? 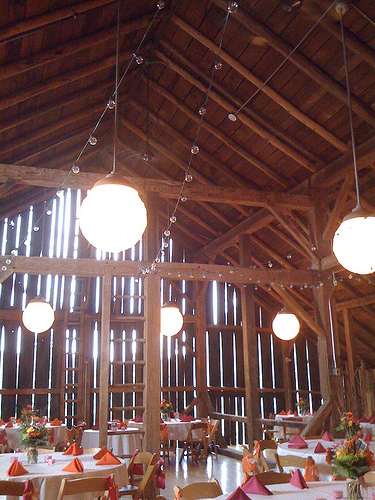 Barns are magical places and great for any style of wedding or celebration. From a formal affair to a country farm wedding you have the best space. Barns can differ! You may have the good fortune to be renting a fully converted barn that has all of the services, perfect floor and proper walls. If this is you then decorating the space will be a lot easier. Think about your theme if you are having a traditional wedding with the tables laid with crisp white linen, silver cutlery and crystal glasses keeping the rest of the decor simple will mean that you make the most of where you are. Classic cut flowers in clear glass vases and candelabras (check if they are allowed) make great barn centerpieces as they are such a contrast to your surroundings. Think about the lighting - a purpose built venue will already have these in place, do they dim and are you happy with the feel. If not, then having up-lighters from the floor by the walls gives a great romantic feel for the evening and it also shows off the walls in all of their barn glory! A farmers theme barn wedding means more rustic, bales of hay to sit on (again check the safety) tables laid with gingham cloths and local flowers adds to the theme. Glass tealight holders are great for the evening and if candles are not allowed then have a look at using the battery tea lights. The great thing with barns is all of the beams, make the most of these with sparkling fairy lights or lanterns. 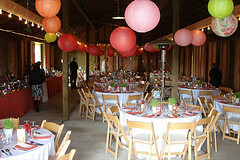 The big paper lanterns look great strung across the barn. Couples who decorate a barn wedding themselves will need the day before hand if possible to organize and get the space ready. You will probably need some big, long ladders to get to the high roof! 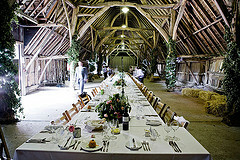 If your barn is normally used for other purposes rather than parties you will need more time to clear the space! You will also need to think of the practical elements - heating, toilets and electricity. Here are some great barn wedding decorations that you could use to make your barn look stunning and they are available in nearly every color you can think of, just follow the link to find the one that you are looking for.